AKJ7076 is a karaoke mixer with a digital key control, a digital echo, and a 100W + 100W amplifier. 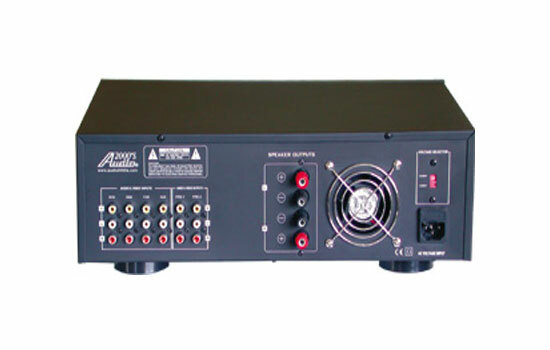 The AKJ7076 digital key & echo karaoke mixing amplifier contains two microphone inputs and four music source inputs. Up to two microphone inputs can be mixed with one of the four music sources. A master volume control knob is used to control the mixed music & microphone volume. level. A music volume control knob is used to control the music volume. There are two individual microphone volume control knobs to adjust each microphone volume individually so that various loudness of individual voice can be compensated as desired. The music source input sound can have the tone adjusted through a treble tone control knob and a bass tone control knob. The AKJ7076 digital key & echo karaoke mixing amplifier further contains the echo control function, the key control function, and voice canceling function. The echo control function enables the users to control or adjust the echo volume, the echo delay, and/or the echo repeat. The key control function allows the users to adjust the key up to +6 or -6 steps. The voice canceling feature is controlled by the MPX Balance knob, which selects the percentage of the music sound from the left channel or right channel. When the MPX Balance knob is turned all the way to the left, all the music sound is solely from the left channel. When the MPX Balance knob is turned all the way to the right, all the music sound is solely from the right channel. As can be seen from the AKJ7076 rear panel, there are four video inputs. Each video input is selected through the corresponding audio input. There are two pre-amp. outputs and one set of the Banana speaker jack. To enhance the heat dissipation capacity, a cooling fan is installed at the rear panel. The AKJ7076 digital key & echo karaoke mixing amplifier has been engineered for high quality sound with a wide dynamic range, low noise level. This is achieved with great attention to various product development stages, from the early product planning stage, through the high quality circuit design stage, to the final production stage with strict component selection. All of these make the AKJ7076 digital key & echo karaoke mixing amplifier an enjoyable karaoke entertainment vehicle for all the users.